Over the course of the last few years I have participated in some very interesting conversations that have been hosted by a company called BWG Strategy. To be perfectly honest, I am not sure how I got connected to these guys, but what I can tell you is that the host, Greg Irwin has been a consummate professional and has orchestrated some excellent phone calls. Let me set the stage. Typically, there is a topic, and the whole reason why I am writing about this now is because last week the topic was ‘data protection’, specifically thoughts around Veeam and CommVault. Greg and the team organizes virtual roundtable and business development events that bring together influential executives & senior professionals to share views and opinions on a specific ecosystem. The folks on the phone are from the partner community, user community and vendor community. The whole purpose behind these events are to get the pulse and some insights of what is going on in the industry and build relationships. I know I use these events to make sure my thinking for my everyday work is on point and meeting the objectives of what the consumer is looking for and to talk with interesting people who cater to a particular market segment and share like interest. As I said, last week we talked about data protection, a topic that I am pretty passionate about. I had to leave the call early unfortunately, due to a prior commitment but I did have some thoughts I wanted to share. So, I figured I would do it here and then share it with all of the folks who were on the call as other who may be interested. When it comes to data protection, I am seeing a pretty marketable trend. As data continues to grow without bound, no longer can businesses continue to just “store their data” in the backup repository and do nothing. No longer can businesses afford to have an insurance policy (backup) that doesn’t help make them money. And no longer can companies have a competitive advantage if they are not looking to leverage the data they have in their 4 walls and use it for multiple business use cases such as DevOps, analytics or reporting. Today’s data protection solution needs to be able to not only protect data and make it available, quickly with next to no downtime, but also provide simple access to this data for the different lines of business or teams inside the organization that need to utilize the data or reuse this data. In 2017, almost 1/3 of the VC money spent on infrastructure technology was spent in the data protection space. Companies such as Cohesity, Rubrik and others have raised almost $500M. 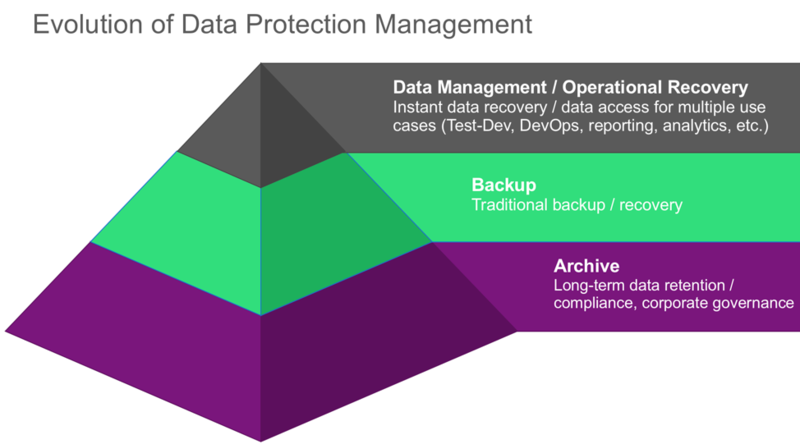 This rejuvenation in the “data protection” space is a result of new capabilities these technologies have when it comes to “secondary storage data management”. It is a combination of the ability to create a copy of data and make it available simply, easily and quickly and on any media type required, especially the cloud. 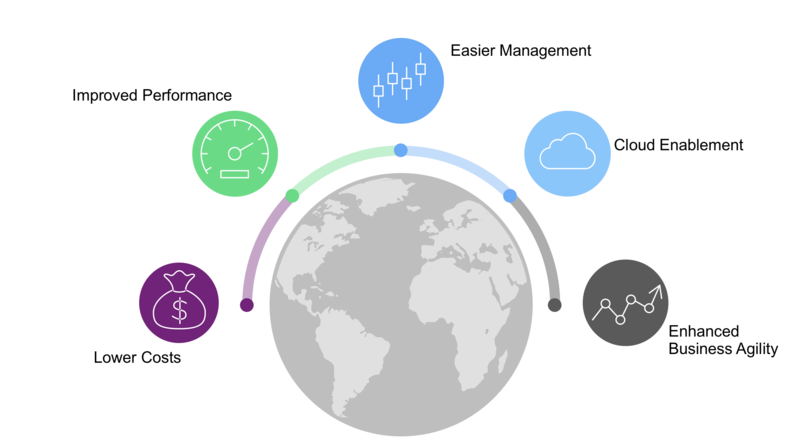 The ability to make data available in the cloud where other organizations can access and use the data taking advantage of flexible cloud resources including storage and compute. There are a few good reasons to modernize your data protection infrastructure and this is the reason for investment in and the resurgence of technology for the next generation of data protection. First, the per unit costs of data protection solutions have come down, quite a bit actually. This means that long term costs for protecting data are not growing nearly as fast with newer solutions and a next generation solution is a good way to keep costs under control from a CapEx perspective. Additionally, one technology solution can do multiple data management tasks. Next, newer solutions provide better performance, not getting data from point a to point b but performance when it comes to RPOs / RTOs. Also, newer technologies are adding more flexibility for faster and simple recovery with the capabilities such as VROs (version recovery objectives) and GROs (geographic recovery objectives). Newer solutions are also very simple. Data protection management has gotten a lot easier based on a number of capabilities including design thinking UIs, virtual deployments, agentless solutions with API integration, and self-service capabilities. Today’s data protection solutions are also able to extend into the cloud simply and easily both as a target and the ability to protect systems in the cloud. And finally, today’s next generation solutions provide the ability to quickly, simply and securely reuse data in the backup repository for multiple business use cases that enable the business to gain insights, meet the demands of the market and be more competitive. End users are also looking at new management techniques when it comes to managing protected data. There is more of a requirement for fast, accurate operational recover or data reuse needs. 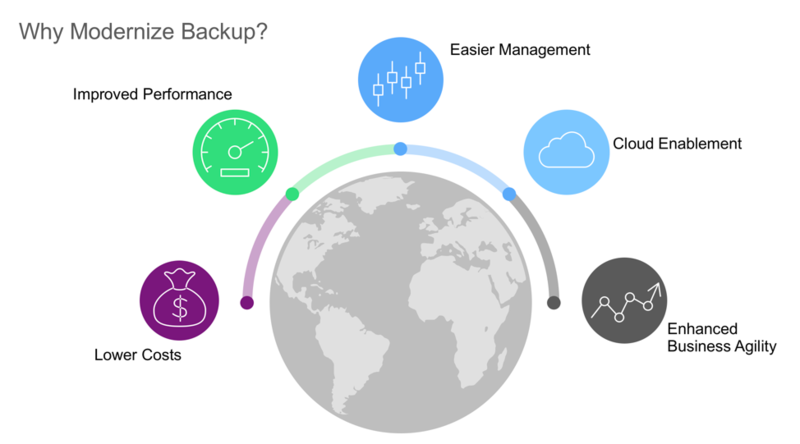 The ability to have quick RTOs and the ability to provide self-service capabilities to the people that need access to the data is the new requirement for the data in the backup environment. Other data that doesn’t meet the criteria for quick operational recovery or reuse, or data that needs to be stored for long term retention can be stored or offloaded using traditional backup technologies, and as the data requires, it gets moved into an archive tier where it is less active and perhaps stored on less expensive media. It is also important to note that should on-line operational recovery data be attacked by ransomware, your longer-term backup solution can be utilized to create the much needed airgap that helps in these situations.